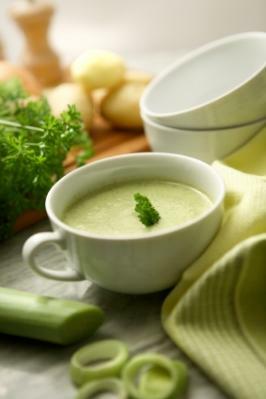 When looking to create a comforting meal take out a stockpot and make leek potato soup to sooth the spirit and the body. This soup is incredibly easy to prepare (even for the culinary challenged) and is wonderful served piping hot on blustery winter days or as cold vichyssoise in the sweltering summer heat. A meal is only as good as the ingredients selected to create it. This concept is particularly true when you create a basic soup recipe that has very few components. The leek is a sweeter, more complex flavored member of the Allium family, which also contains onions, scallions, garlic and shallots. This vegetable provides vitamin C, vitamin K, vitamin A, vitamin B6, folate, iron, and fiber. Leeks are available year round but are actually in season from the early fall to spring. The best leeks for soup are less than an inch and a half in diameter and preferably one of the overwintering varieties such as Blue Solaise. Potatoes belong to the nightshade family and are a great source of vitamin C, potassium, calcium, folate, iron, vitamin B6 and fiber. The best potatoes to make leek potato soup are high-starch russets or medium-starch Yukon golds with smooth, unbroken skins and no green tinges. The other more waxy potatoes can stay too firm and not break down to create the coveted creamy texture. Homemade stock, either vegetable or chicken, is the best liquid to use for leek potato soup. Make sure the stock is mild in flavor so it doesn't overpower the taste of the soup and always use low sodium stock if it is purchased. You can use water, but it does not impart any taste or enhance the finished dish. This recipe serves four main course meals or six appetizer size portions. Cut the small bulb off the bottom of the leeks. Trim the dark green area off the tops. This darker part is tough and bitter in taste therefore not suitable for the soup. Strip off the outermost white layer as well, because it can also be dry and tough. Cut the leeks lengthwise in half and then chop finely. Leeks can have dirt and grit in the layers so it is important to clean them thoroughly in cold water. The best method is to dump the chopped leeks in a bowl of deep water and swirl them around to loosen the trapped dirt. The dirt will sink to the bottom of the bowl and then you scoop out and strain the clean leeks. Wash and peel the potatoes and then chop into small cubes. Place a heavy large pot over medium heat and melt the butter taking care not to brown it. Add leeks and onions to the pot stirring to coat in the butter. Sauté the vegetables until they are translucent and soft, about eight to ten minutes. Add potatoes and liquid to the pot. Bring to a boil then reduce heat, cover and simmer the soup gently. Cook until potatoes are very tender, approximately 20 minutes. Remove the soup from the heat and let cool 10 minutes. Puree the soup in a food processor in batches or put a hand blender right in the pot to create the desired texture. For an incredible velvety soup, strain the pureed product through a sieve. If a thinner soup if desired add more stock or water. Do not puree, leave the finished soup chunky and rustic. Add two cups of cooked potato cubes to pureed soup. Add lightly blanched chopped leeks to finished soup. Top with grated sharp cheddar, or another favorite cheese such as Stilton. Top with a drizzle of cream, crème fraiche or sour cream. Add crispy cooked bacon bits or sliced cooked sausage. Garnish with fresh chopped herbs such as parsley or tarragon. Top with crunchy garlic croutons. Spice the soup up with curry, ginger or chilies. Puree greens such as watercress into the finished soup. Garnish with chunks of smoked fish. Flavor with roasted garlic cloves prior to blending.